Even though I'm nearly 30 years old, summer still conjures that same gut feeling of the glorious promise of unlimited free time that I felt as a kid. When I was younger, summer especially meant more time to read! I loved having nothing to do all day except finish my book, take weekly library trips, complete summer reading programs, and go book shopping with my mom to stock up for our annual summer road trip. Books were always the highlight of my summer, and back then reading was 100% stress free. As an adult, I hate to say, I feel pressure to use my time "wisely", and that generally means reading as many books as I can each month, often trying to keep up with what's trending, at a breakneck pace, so I can get through my never-ending-always-growing TBR mountain. How many of you have avoided reading a huge classic novel, simply because it was a big time commitment? Yeah, me too. It feels like you're giving up the 3 other books you could read in the same time frame...but you know what? I find that they're always worth it. So this July, I decided to hit pause on my TBR and spend a few weeks solely in the company of a big classic novel I've been meaning to read for years: The Three Musketeers. I didn't want to rush through it, instead I wanted to savor it's company and try to recapture that endless feeling from the summers of my childhood. So the timeless adventure novel came along with me for the ride as my personal adventure buddy while I travelled through parts of the Western US this month. We began our adventures together with the long drive from Washington to Montana. My brother and I were off to visit our grandma, we and switched off between who drove and who read the book aloud. I'm sure most of you have listened to an audiobook...having someone sitting next to you and giggling over passages as they read a book aloud is about a thousand times more entertaining and I highly recommend it. It was extra entertaining in this case because the book is shockingly funny, and we weren't expecting how completely looney tunes it was! Athos, Porthos, Aramis, and d'Artagnan continued to hang out with me in Montana. They came to a small town 4th of July parade, saw fireworks, a rodeo, attended a dinner party, and were also dragged to restaurants, bars, scenic views and calm, park-like settings all throughout our stay. 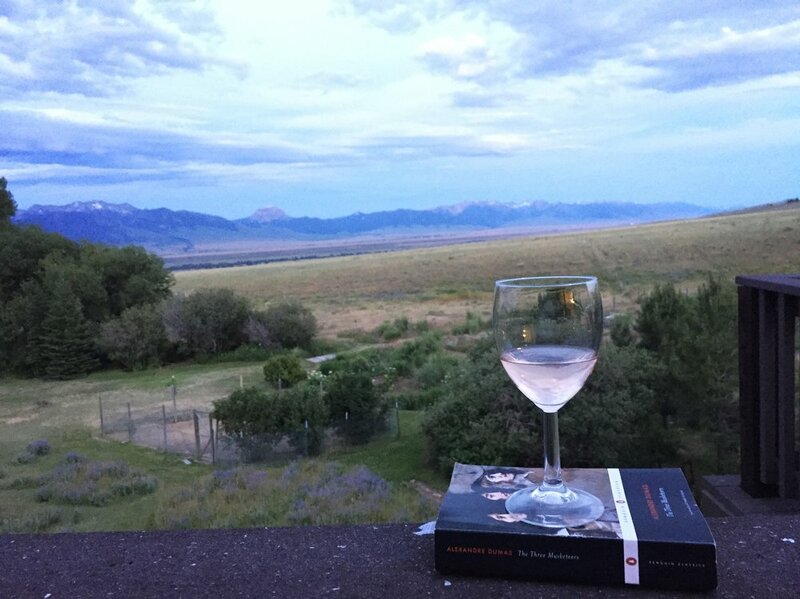 Some of the best reading I did was on my grandma's deck with a cup of coffee and her million dollar view of mountains off in the distance, framed against the endless sky. They don't call it "big sky country" for nothing. Once again, we read aloud on the drive home, and back in Washington the musketeers were my cozy companion in my house, on beaches, and at my favorite cafe's. The book sincerely saw me through a memorable period of my summer, and became almost like a safety blanket; I began to panic a little if I was out and realized the book wasn't with me! I thoroughly enjoyed spending time with it, and laughing at the exploits of the musketeers and marveling at Dumas' genius. Most of all, my increasingly battered copy began to feel like a friend. By the end of our journey together, it had collected dust from a rodeo, water marks and sand in it's spine from Washington beaches, bends and wrinkles in the cover from being shoved into purses, a bent spine from being left laying open around my house, and sun fading from being stuck on dashboards or left outside on the table while I played with my son. The crisp edges and smooth, inky black of the cover are long gone, and in it's place is a book marked with all the love and adventure of the past month. It was difficult to close it for the last time, and place it back in it's slot on my shelf; it felt like saying goodbye. But the best part of books like this, is that they'll be waiting for you when you're ready to pick them up once more and dash off on another adventure. What big novel have you been avoiding? Or what big novel have you recently read and enjoyed spending time with?